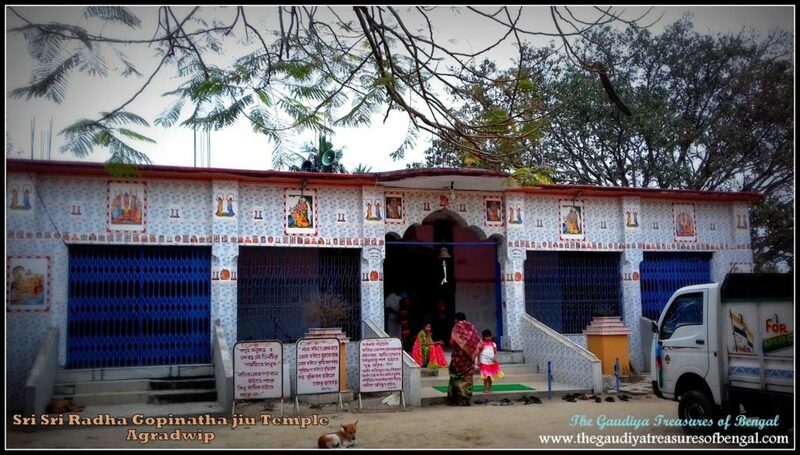 Just opposite to Govinda Bhavan (presently rented to Gita press), lies the ancient temple of Radha Govinda jiu. A.C Bhaktivedanta Swami Prabhupada ,the founder acharya of Iskcon, used to visit this temple daily when he was a little child. In one of his later conversations, Prabhupada identified Radha Govinda jiu as the inspiration of his devotional life. The mesmerizing deity of Sri Radha Govinda jiu with their slanting eyes continue to enchant one and all with their blissful darsana. This beautiful temple and its deities were established around 200 years ago by Late Srimati Chitra dasi (wife of Sri Rama Locana Mullik) on the 12th of February, 1822 AD. In addition to Radha Govinda jiu, the temple also houses the enchanting deities of Gaura-Gadadhara and Sri Balarama Revati devi. The present priest Sri Durga Pada Chattopadhyay has been serving this temple for the last 35 years. The Krishna Raya temple is one of the biggest in Bengal and is one of the most significant for the Gaudiya vaishnavas. Situated in Halisahar, the temple comprises a spacious compound ,adorned with beautiful gardens and high boundary walls on its four sides. The temple today also houses a big kitchen along with residential quarters. Sri Nimai Mullick, the then prominent zamindar of kolkata, is said to have seen the broken down temple while he was on his way to Benares. The pious zamindar thereafter reconstructed the temple and arranged for the proper worship of the deities in the year 1786 AD. Sri Krishna Raya are the worshipable Radha Krishna deities of Sri Srinatha Prabhu, the spiritual master of Kavi Karnapura, the third son of Sivananda Sen. To read more, please refer to the article entitled – ‘Krishna Raya Temple and the residence of Sivananda Sen ,Kumarhatta (Halisahar)’. A few miles south of Katwa, on the bank of the holy Ganges, lies the beautiful town of Agradwip. The scenic beauty of this place is an absolute treat to the eyes. Our team from ‘The Gaudiya Treasures of Bengal’, took a boat ride from the ‘Agradwip ghat’ to cross over to the other side of the river,in order to reach the temple of our beloved Radha Gopinatha jiu.Sri Radha Gopinatha jiu is the worshipable deity of Sri Govinda Ghosh, an eternal associate of Sri Caitanya Mahaprabhu. 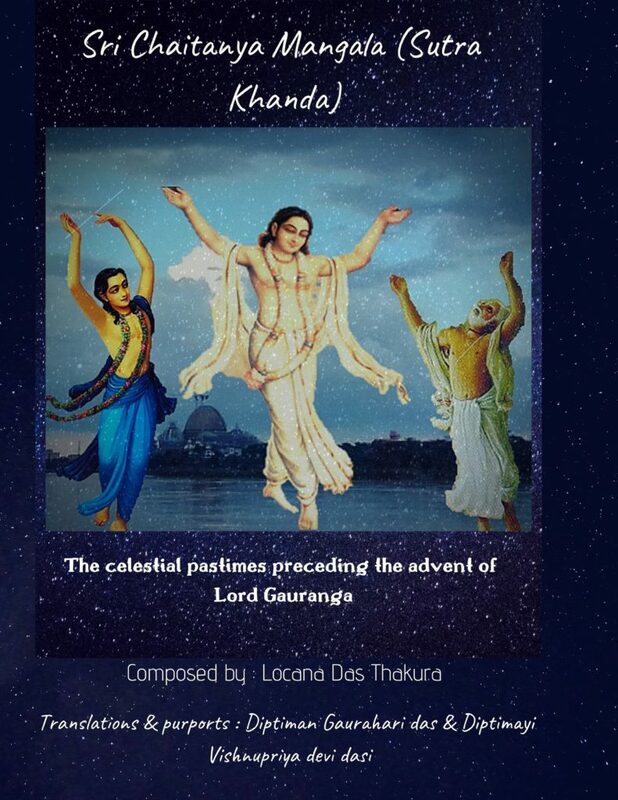 In Sri Caitanya Caritamrta, Srila Krishnadasa Kaviraja reveals that Sri Govinda Ghosh was the leader of one of the seven groups who sang and danced in ecstasy during the Rathayatra in Puri. He was the incarnation of the gopi Kalavati whose songs provided immense pleasure to the divine couple in Vrindavana. Sri Gopinatha jiu performs a very unique pastime here at Agradwip. Keeping the promise that he had once given to Govinda Ghosh, whom He loved as His own father, Lord Gopinatha has been dutifully performing, all the duties that a son would do to please his father.Every year ,here at Agradwip, the pind-daan ceremony of Sri Govinda Ghosh is performed by Sri Gopinatha jiu ,on his tirobhava tithi. A huge festival takes place during this time of the year at Agradwip. The festival is renowned as ‘Agradwip mela’ or ‘Ghosh Thakurer mela’, and thousands of devotees gather here from different parts of the world,to participate in this festival. To relish more nectarian pastimes of Sri Gopinatha, please refer to the article entitled – ‘Sri Sri Radha Gopinatha jiu ,Agradwip’. The pious Mallicks ,who were the zamindars(landlord) of this area, have legally transferred the authority of the temple compounds and the adjoining lands unto Sri Gopinatha jiu. Sri Radhavallav jiu is the third of the deities that was carved out of the sila (stone) that was brought by Birchandra prabhu from the Nawab’s palace in Malda.The other two enchanting deities being Sri Syamasundara jiu of Khardaha, and Sri NandaDulal jiu of Saibon.Every Year,on the day of Magh Purnima (the full moon day in the month of january-February), a huge festival takes place here at Serampore,Saibon and Khardaha ,at the site of these three deities, to commemorate their installation,500 years back. Gaudiya Vaishnavas gather from all around the world to participate in this festival. Sri RadhaVallav jiu is so beautiful that one might want to gaze at His beautiful form forever. Simply seeing His charming smile makes one forget the illusory problems of this material world.’The Gaudiya Treasures of Bengal’ considers itself extremely blessed and fortunate to have taken darsana of Sri RadhaVallav jiu’s captivating form and to have prayed for His shelter and mercy.The original temple was constructed by Yogi Rudraram pandita, and was later rebuilt by Zamindar Sri Nayan Chand Mallick (ancestor of the Mullicks residing at pathuriyaghata street today). 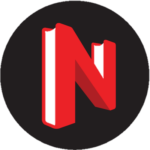 His son Sri Nimai Charan later arranged for the Nitya seva (daily service) of the lordships. 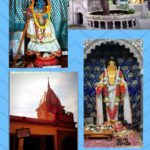 Sri Nayan Chand Mallick and his son Sri Nimai Charan were devout vaishnavas and have properly engaged their financial resources in constructing and rebuilding several significant temples all over Bengal for the pleasure of the Lord and His devotees. 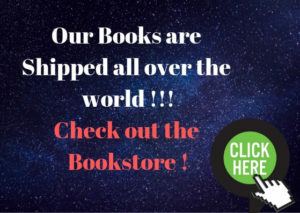 We have covered the pastimes of Sri Radhavallav jiu in a separate article entitled – ‘Sri RadhaVallav Jiu, Serampore’ . 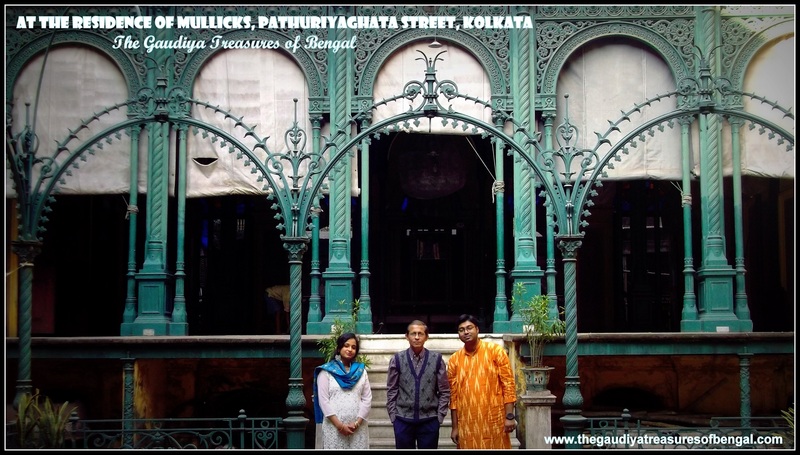 This grand heritage building of pathuriyaghata street was constructed by Motilal Mullick, the son of Nimai Charan Mullick. 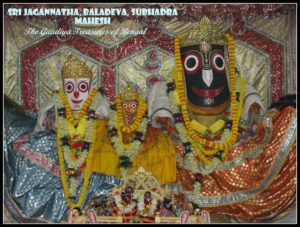 The captivating and ancient Jagannatha ,Baladev and Subhadra Maharani deities of Mahesh are the worshipable deities of Sri Dhruvananda and Sri Kamalakara Pippalai. Dhruvananda was a great soul, whose love and devotion caused the Lord to descend in the form of these beautiful deities. The service was later handed over to Sri Kamalakara Pippalai who was an intimate associate of Sri Nityananda Prabhu. 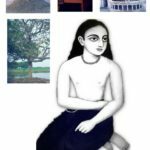 He was one of the 12 Gopalas, (Dvadasha Gopala) and according to Sri Gaura Gannodesha Dipika , Sri Kamalakara was the incarnation of the cowherd boy Mahabala. 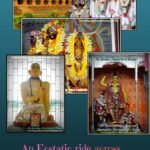 To read more about the beautiful pastimes of Lord Jagannatha in Mahesh, please refer to the article entitled – ‘Sri Jagannatha Temple of Mahesh, Serampore’. The beautiful deities of Mahesh has mesmerized and captured our hearts forever. 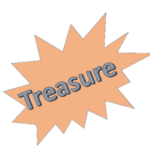 Simply taking their darsana can sow the seeds of bhakti within one.Long back, around 1653 AD, there was a severe scarcity of funds that hindered the seva puja of the deities. 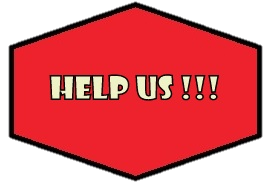 As a result the then Nawab of Dhaka,Shah Shuja, had donated about 395 acres of land for the sustenance of this temple. The land being in possession of Lord Jagannatha, the village came to be known as Jagannatha Pura.The old temple of Mahesh,however, got destroyed due to the shifting course of the river. 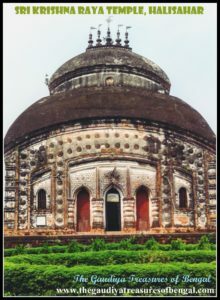 The temple in its present shape was later constructed by the pious zamindar Sri Nayan Chand Mallick. 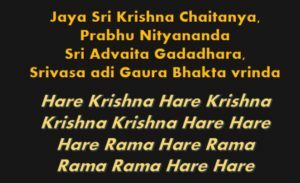 – Srila Krishnadasa Kaviraja Gosvami identifies Sri Gadadhara das , to be the twenty-third branch of Lord Caitanya’s desire tree of devotional service .He has also referred to him as the ‘topmost’ (sarvopari) branch, for he had inspired the Kazi (Muslim Magistrate) to chant the holy names of Lord Hari. 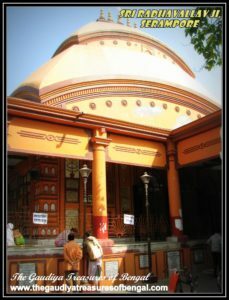 (Sri Gadadhara das shakha sarvopari, kazi ganera mukhe yenha bolaila Hari).The Sripat (residence) of Srila Gadadhara das is situated on the outskirts of North Kolkata, at a place called Ariadaha. 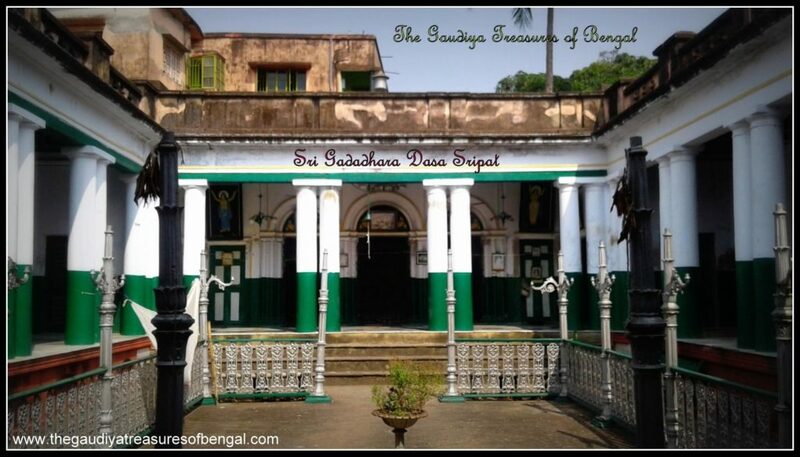 Located on the bank of the Ganges, this exalted site, is exceedingly beautiful and spiritually surcharged.Sri Gadadhara Das had resided over here at Ariadaha for many years.Finally he shifted to Katwa, where he spent his last days serving the deity of ‘Bara Gauranga’ at Gauranga Bari.Here at Ariadaha, Sri Gadadhara Das had manifested several of his heart melting pastimes. It was here at Ariadaha that he had established the worship of his beloved Bal-gopal deities.Lord Nityananda had also spent a few days here and had performed His ecstatic sankirtana pastimes. 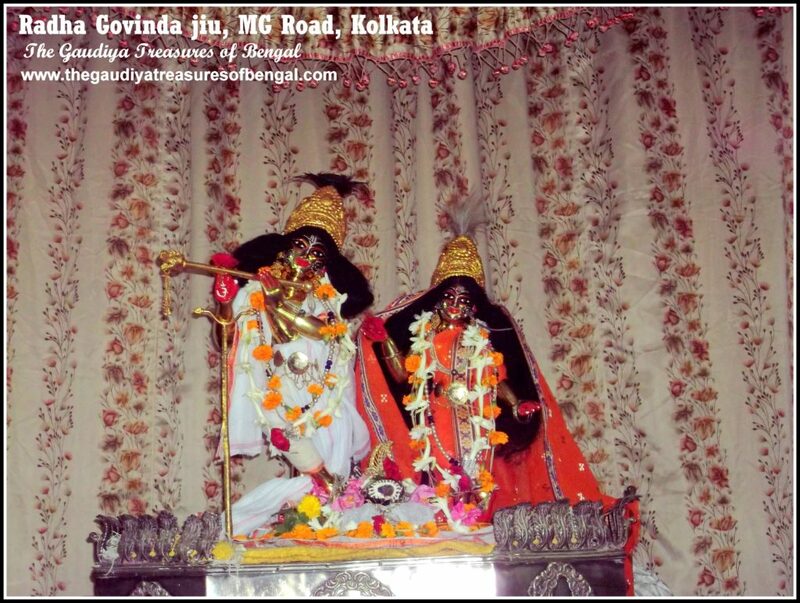 The bal gopal deities of Sri Gadadhara are still preserved over here at Ariadaha. To read more about this place, please refer to the article entitled – ‘Sri Gadadhara das Sripat , Ariadaha’.The temple has been managed by different authorities in the course of these last 500 years.Finally the temple was renovated in the year 1849 by Sri Madhusudana Mullick of Kolkata, who had also arranged for the deity worship to be carried out properly. So this is another of the great Gaudiya pilgrimage sites, that have been preserved and protected by the Mullicks. We worship the lotus feet of our spiritual master ,whose causeless mercy has empowered us ineligible fools ,to gain entrance and take up service in this transcendental abode of Bengal. We seek shelter of this holy land, and pray that its glories remain forever imprinted in our heart.‘The Gaudiya Treasures of Bengal’ humbly prays to the devoted Mallicks that we advance in our Krishna consciousness, develop attachment unto the lotus feet of Lord Gauranga and are able to serve Sri Guru & Vaishnavas, by our honest and sincere efforts.We seek their blessings and compassion , in successfully rendering this humble service of reciting the pastimes and revealing the pastime places of the Supreme Lord and His beloved associates.We shall consider ourselves greatly fortunate and our existence meaningful if Lord Gaurahari and our dear spiritual master are kindly pleased with our endeavours. One can board a metro and get down at the Girish park Metro station. From there one can hire a rickshaw to directly reach the house of the mallicks (also spelt as ‘Mallik’ or ‘Mallick’) at Pathuriyaghata street. 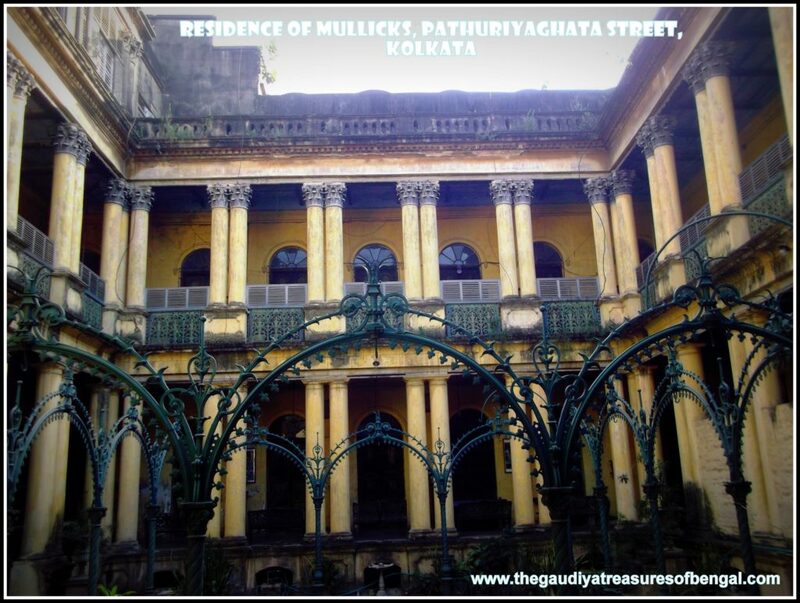 The exact address of the residence is 67 Pathuriaghata street, kolkata -700006.This grand heritage building was constructed by Motilal Mullick, the son of Sri Nimai Charan Mullick.